Several weeks ago I wrote about ‘Wishbone Day’ and Mykayla, a student at our school, that has Brittle Bone Syndrome. I wanted to post an update. On the last week of school Mykayla’s wheelchair rolled off the curb and she fell face forward. Mom rushed her to the emergency room where they checked for a concussion and broken bones. The MRI showed fluid on the brain and x-rays showed a broken arm. The fall was a blessing in disguise because the fluid on the brain was existing and Erica didn’t know about it. Mykayla was in a lot of pain, but sure enough, the very next day she was at school! At our end-of-year assembly she won a bicycle for perfect attendance. To call her a trooper is an understatement. Mykayla kept telling her mom that both arms were broken so Erica took her back in to the doctor. Of course Mykayla was right… she broke both arms in her fall. 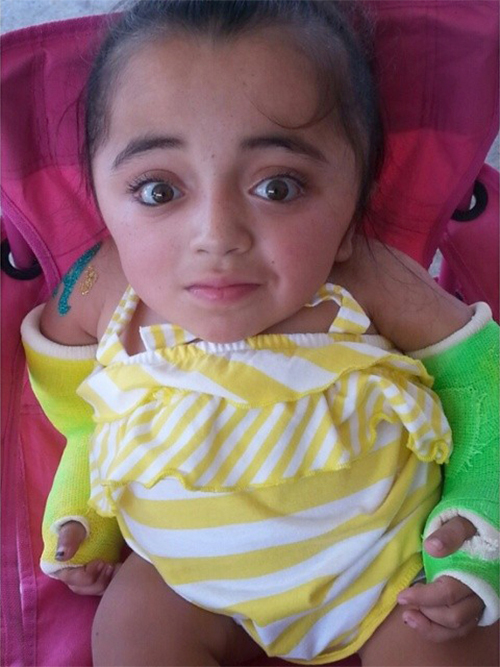 This gave her the opportunity to have her casts done in her favorite baseball teams colors… green and yellow! This is a picture that Erica posted on Facebook and gave me permission to share with you. Mykayla with her Oakland A’s casts! What a sweet little girl. Bless her heart. Love that sweet little girl and her Mother! They are both amazing people who always look for the best!